Sappan wood or East Indian red wood is a natural dye yielding medicinal plant. Sappan wood is one of the most widely used plant dye; in use since ancient times textile for its predominant red color. Heartwood yields a valuable red crystalline dye, brazilin. Chiefly used as a dyewood, popular for coloring cotton, silk, and wool fabrics. Heartwood is also being used to color wines and meat. The roots of the plant called “Yellow wood” are also used to make Yellow dye. By manipulating the pH of the dye bath by the addition of wood ash water or vinegar, the dyes’ produce everything from deep eggplant to lavender and maroon to ox-blood red color. The mordanted dye with alum displays good fastness towards washing. 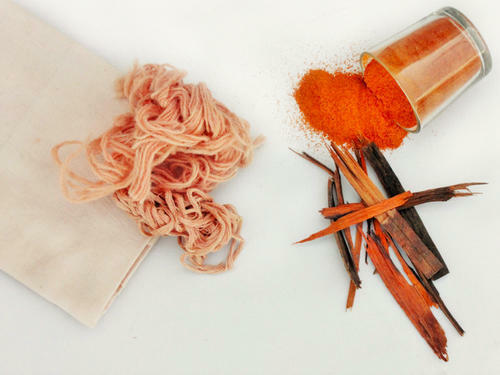 The dye is seen to have anti-inflammatory activity. We at Sodhani Biotique are a team of a youthful and enterprising mix of passionate young individuals, and our mission is to promote the oneness of our life with our environment. We have undertaken the challenge of producing 100% natural Colors and Clothing with a range of our Vegetable Dyes and varieties to choose from, so as to overcome the pollution and harm caused by the regular synthetic-chemical laden dye and textile industry, as we believe that is the most sustainable and futuristic way of life.We export our products to countries like Europe and US.